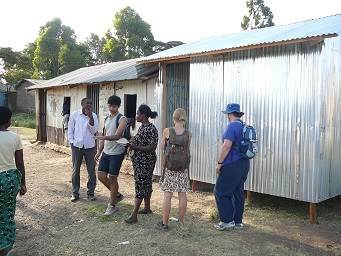 The January 2015 trip to Nairobi by five volunteers was extremely successful. The team achieved so much that is really is not possible to do justice to their work in this newsletter. The toughest task was organising the deworming of the pupils at PaR schools with the Kenyan Ministry of Health. Numerous people and organisations were visited including the WHO, AMREF, Kenyatta Hospital, and City Hall before the correct contacts were made. 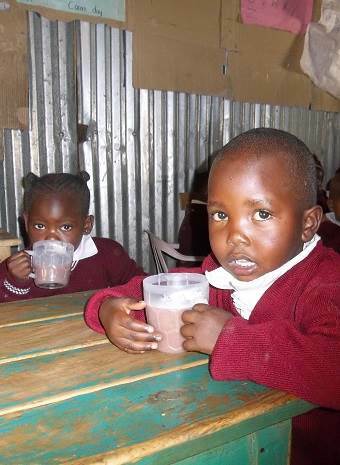 The easiest task was the roll out of the feeding program at our third school, Lizpal. It was completed quickly and easily. The team proved conclusively that the feeding program is totally scaleable. All that is needed is the funding and Porridge and Rice can install a feeding program within a day at a new school. 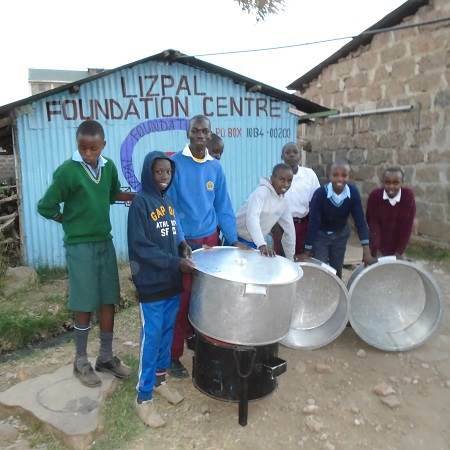 In January, Porridge and Rice lauched a feeding program at Lizpal, the third school to join the Porridge and Rice team. Each school morning, pupils and teachers at Lizpal receive a hot cup of Uji, and once a week a piece of sweet potato for breakfast. The Uji (sorghum wheat and millet) provides Iron and the sweet potato provides Vitamin A. Lunch is bean stew with Kale on rice for four days, and beef stew once a week. The Kale and beans more Iron, a mineral is short supply. Iodised salt is added to the stew to provide Iodine. Finally, a piece of seasonal fruit ranging from bananas to mangoes is provided after lunch to provide the Vitamin C essential to the children's diet. Water is very expensive in the slums with people paying up to 10 times as much as people in the suburbs. In addition, water in the slums is delivered in containers that are frequently not clean. Thanks to a very generous donation, we have installed a 5000 litre tank at both Glad Kids and Lizpal schools. Water will now be delivered in a water tank directly from a bore hole every two weeks ensuring that arrives clean. This will cut the cost of the water to around a fifth of what is was before. Clean water is essential. It is not only used for cooking and drinking but also for handwashing and disinfecting of places like the toilets. After nearly two weeks of visits and meetings, Porridge and Rice is now registered as partnered with the Ministry of Health in Kenya. This gives all the schools we support access to free medical services including immunisations and vaccines. As a result, all 5 year olds and under at our schools have been treated for worms with Albendazole and received Vitamin A supplements. In addition, they have been weighed and measured, and will be every 6 months to ensure that they are growing and developing normally. 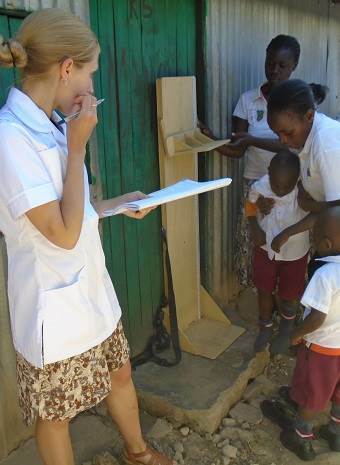 In July, we hope to expand the deworming program to older pupils, and families. For now though, this is a significant milestone in our health program. Porridge and Rice continues to help to improve and maintain facilities. Whenever funds are raised, the difficulty is deciding priorities. This January, a kitchen was built for Glad Kids who have to date cooked meals in the open air, and a local doorway when it rains. Now Glad Kids has somewhere to store food safely and to cook under cover each day. The projects that are being planned for when funding is available are three new toilets for each school, a wash station for each school that allows 5 children at a time to wash their hands, new floors for the classrooms at Glad Kids, gutters and tanks to capture rain water, and more classrooms for Lizpal and Excel. The long term plan is to raise sufficient funds to buy land and build permanent schools. This will save a fortune in rent, provide considerably better facilities, and reduce maintenance costs. In the meantime, it is essential to maintain the current facilities to provide an environment conducive to learning. 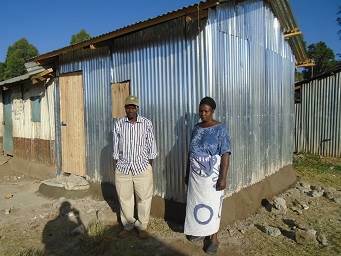 One of the big goals for 2015 is to buy land in the Nairobi slums. The purpose of the land is twofold (1) to build permanent buildings to house PaR schools, and (2) to raise money to fund PaR schools. In respect of the latter, there is a huge demand for water and a bore hole can generate significant income. The plan is to put a bore hole on the land first and sell water in the slums using the income to help build and run schools.